Friday, March 8, 2019, was the 150th anniversary of the death of Hector Berlioz, and commemorations included a performance of his “Grande messe des morts (Requiem)” at St. Paul’s Cathedral in London. John Nelson conducted the Philharmonia Orchestra, the London Philharmonic Choir, the Philharmonia Chorus, and tenor Michael Spyres. 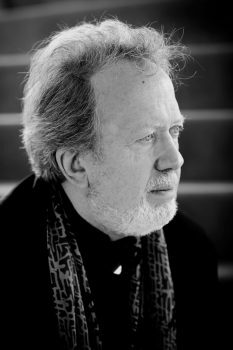 I was lucky enough to be able to catch up with Nelson in a break from rehearsals to chat about Berlioz’s “Requiem” and Nelson’s other plans for performances of Berlioz this year. The grandeur of the “Requiem” matches that of St. Paul’s space, but acoustically the cathedral is not ideal, though those sitting under the rotunda would have gotten a good experience, Nelson said. When discussing the work, he pointed out that Berlioz himself highly regarded it. Toward the end of his life, Berlioz said that if one of his works survived, it would be that one. Nelson feels that it is a work that needs to be considered not just for its obvious grandeur but also for its essence, the musical interpretation of the text. With the enormous number of musicians involved in the large space of St. Paul’s Cathedral, with the four bands in the rotunda, Nelson agreed that the performance had indeed been impressive. 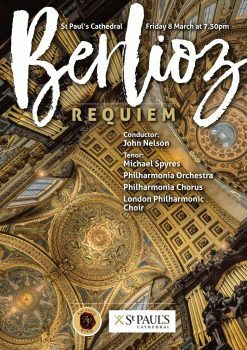 But beyond the sound quality, Nelson was also after the textual meaning of the “Requiem.” While Berlioz was not religious, Nelson feels that he wrote sincerely. Berlioz was from a Roman Catholic family, and the memory of that is surely present in the work. Nelson finds a sincerity running through the entire piece. The idea for the performance arose after the performances of “Les Troyens” in Strasbourg. It was to commemorate in St. Paul’s the 150th anniversary of Berlioz’s death on that very day. The venue that had been used for Sir Colin Davis’s performance of the “Requiem” with the London Symphony Orchestra in 2012. Pulling the performance together proved a complex operation, yet possible. Though the cathedral was used as a concert hall infrequently, cathedral officials were sympathetic to the performance, and it proved possible to have Warner Classics record it and Medici TV livestream it. Also, the tenor Michael Spyres was free. The acoustics in St. Paul’s Cathedral made recording a challenge. Nelson feels lucky that the production team included the sound engineer who worked on Colin Davis’s live recording of Berlioz’s “Requiem” at St Paul’s (on the LSO Live label), as well as the French engineer who has worked on all of Nelson’s other live Berlioz recordings. For all the work’s size, Berlioz was very exact in his specifications of the number of performers required for the “Requiem,” and Nelson is pleased that the numbers they used came pretty close to Berlioz’s specifications. The choir numbered 208 and Berlioz specified 210, while each section of strings had two players fewer than what Berlioz requested, and so there were 10 bass players instead of 12. This exactitude is matched by the detail in Berlioz’s score, which Nelson calls stunning. The work was written in 1837, only a decade after the death of Beethoven, who used few markings, in 1827, so Nelson finds the minutiae of the markings in the score remarkable. Berlioz gives little room for interpretation, as he knew what he wanted. Nelson feels obliged to follow these details, with only a couple of places where he thinks that Berlioz misjudged matters. Berlioz has been with Nelson for a long time, ever since he left music college. Nelson studied conducting at the Juilliard School with a French conducting teacher, who never once talked about Berlioz. 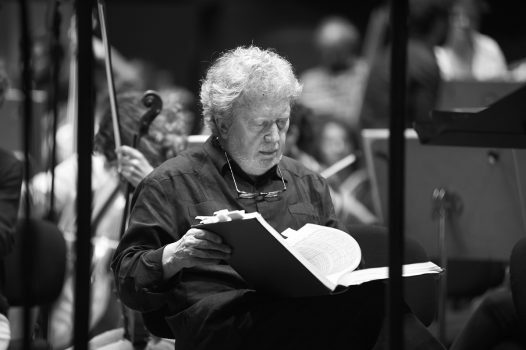 When Nelson graduated, a friend from college, Matthew Epstein, suggested he listen to the then new recording of Berlioz’s “Les Troyens” conducted by Colin Davis, and Nelson found it stunning. “I thought I had never listened to music before,” he said. The opera had never had a complete performance in America, so with the confidence of youth, he and Epstein organized a performance of the complete, uncut “Les Troyens” at Carnegie Hall in 1972. Nelson was in his early 30s. Two years later, Nelson was hired to assist Rafael Kubelik in the American premiere of the staged opera at The Metropolitan Opera. When Kubelik fell ill after the second performance, Nelson stepped into the pit with Christa Ludwig (as Dido) and Jon Vickers (as Aeneas) staring down at him. And for Nelson, the rest is history: He was invited to conduct “Les Troyens” at the Grand Theater in Geneva, Switzerland, for his European debut, and many other invitations followed. In April 2019, Nelson will be conducting performances of Berlioz’s “La Damnation de Faust” with Orchestre Philharmonique de Strasbourg and soloists Michael Spyres, Joyce DiDonato, Nicolas Courjal, and Alexandre Duhamel, which will be recorded for release on Warner Classics. Nelson has conducted “La Damnation de Faust” both as an opera and as a concert work. While Berlioz did not write the piece as an opera, he put in so many instructions that it seems as if it was meant for the stage, but Nelson prefers performing it in concert. This allows the audience to create their own images to accompany the music, and Nelson feels sure that this is what Berlioz intended. Nelson will also be performing and recording Berlioz’s “Roméo et Juliette,” an interpretation of the story with little singing in it. Around a quarter is textual, and the rest is all orchestral so that the listener’s imagination is induced by the music. It is not a conventional work. Nelson says that Berlioz did not think the way other composers did. He was something of an iconoclast, deliberately going against the norms, but there’s a genuine sincerity in everything Berlioz wrote, even though some find the work extravagant. 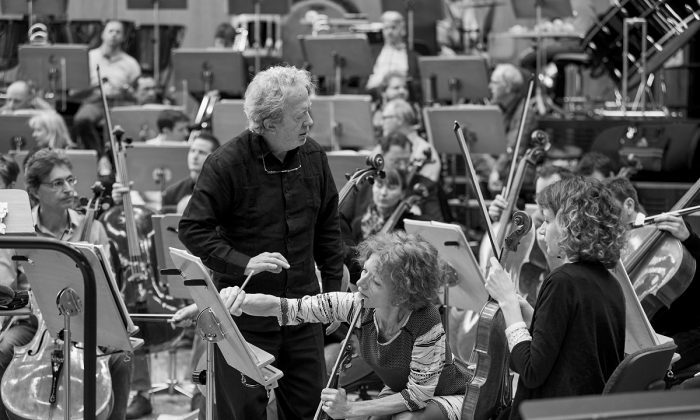 In 2020, Nelson will be performing and recording “L’enfance du Christ,” and there are also plans for “Symphonie fantastique,” which he will be pairing with “Lélio.” Berlioz wrote the latter as a sequel to the symphony, and though Nelson feels that it does not really hang together well, he thinks that it is important to include it with the symphony. The recording of the “Requiem” will be out on Warner Classics in early autumn, with “La Damnation de Faust” in November, and “Roméo et Juliette” in 2020.